Should leaves with shot hole be composted? 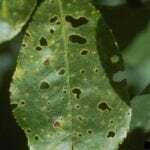 Leaves fall from Prunus subhirtella in autumn with holes in them (shot hole disease)...is it safe to compost them in black plastic bags? Dispose of infected leaves by burning if possible. Do not compost.